Kripter Domino PV mounting system | Atmosfera™. Альтернативные источники энергии. Солнце. Ветер. Вода. Земля. Installation system of solar fields Kripter Domino is the universal solution for ground-based arrangement of solar power plants. It is suited to installation in sites almost with any lie and soils. It is compatible with different types of foundation supports, such as geo screws, post or mat concrete foundations. 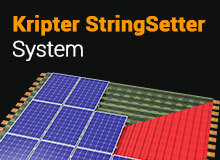 Kripter Domino systems are compatible with any standard poly- and monocrystal 60-cells PV modules, as well as Half-Cell modules, being similar to them due to the size. PV modules can be installed only in “portrait” orientation. How to work with Kripter Domino? 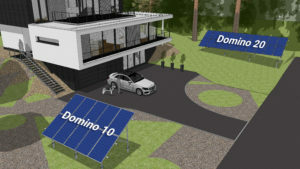 While designing the future solar field on Kripter Domino it is necessary to calculate the amount and width of PV panels’ “desks”, taking into consideration the sizes of the site and objects (buildings, trees) that exist in it, as well as the shading. After that it is enough just to order the needed amount of Kripter Domino kits for necessary amount of PV modules – from 10 to 50 pieces. The design of solar “desks” Kripter Domino is optimal and universal. The system has the excessive resistance to wind and snow loads. All units and components passed through verification on test rigs and existing solar power plants in different regions of Ukraine. The assembly of the system is reduced to its lowest terms and allows installing the solar field even by a small team during 1 working day! Kripter Domino 20 (for 20 modules). The manufacturer warrants the resistance of Kripter Domino assembling design to meteorological loads and the durability – the life time is 25 years (warranty for through rust – 10 years). * Kripter Domino kits include all necessary parts, including universal installation “sole” to be attached to geo screw, anchors or captive studs. The geo screws and embedded parts to be poured into concrete are not included into the price of kits and are ordered on individual basis.